For most part of her life, fifty-year-old Asha carried tourists on her back at Amer Fort in Jaipur. She slogged for several hours a day, walking up and down steep terrain and enduring extreme weather in the desert state. 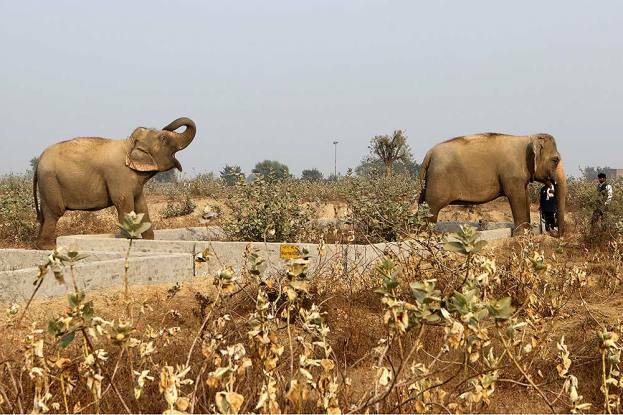 Today, she ambles in her enclosure at the Elephant Conservation and Care Centre (ECCC) in Uttar Pradesh’s Mathura district. During summers, she often slides in the pool within her compound to cool herself. She is well fed, cleaned regularly and has the company of Suzy, twenty years her senior. An untreated fracture in her left foreleg long ago has made it stiff; she drags it mostly. The other leg is swollen and is yellow from the turmeric treatment it received from the vet. The ECCC was established by Wildlife SOS in Mathura in 2010, but the hospital—supposedly the first one in the country—opened last November. Founded in 1995, Wildlife SOS is a non-profit organisation working for the protection and rehabilitation of wildlife, conservation of their habitat, and rehabilitation of people from erstwhile poacher communities. The centre thrives solely on donations and CSR funds and has a daily operational cost of Rs 1 lakh—the elephants’ diet takes the lion’s share of the expenses. 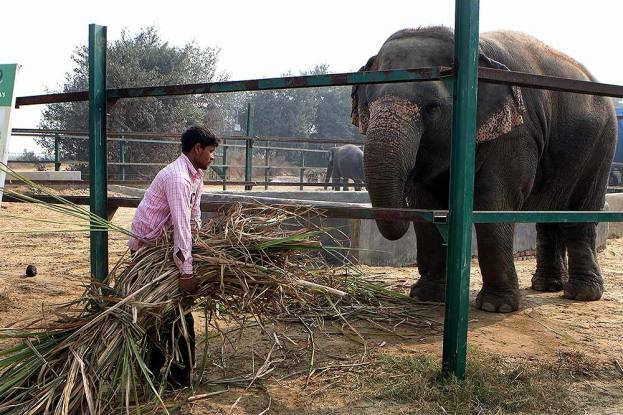 The centre was set up in collaboration with the Uttar Pradesh Forest Department, which has given them the requisite permissions to carry out the care of the elephants. Wildlife SOS also runs a bear facility, ten kilometres from the ECCC, for rescued sloth bears. 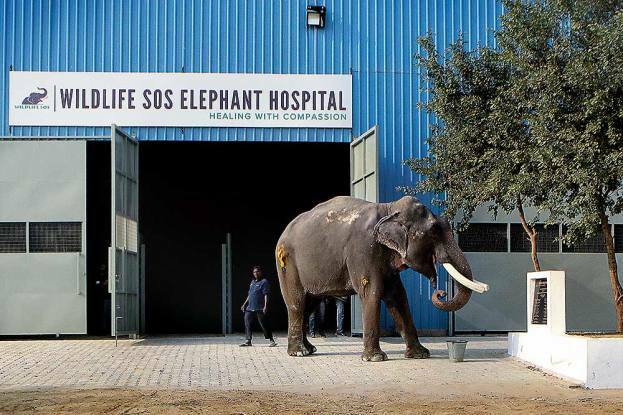 Spread over 12,000 square feet, Wildlife SOS’s hospital is equipped with the latest machinery for the treatment of pachyderms. 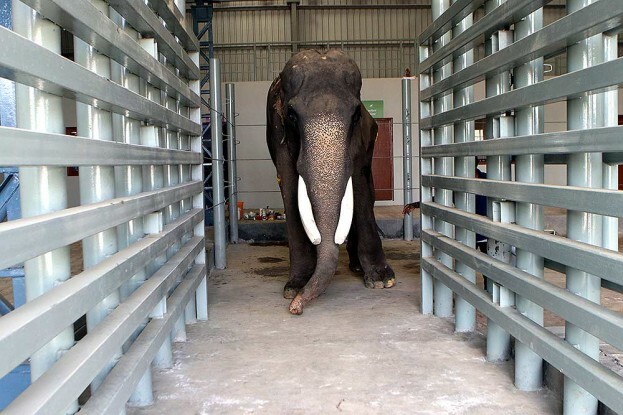 The hospital also has a crane-­system for lifting elephants, a portable digital ­radiography machine for carrying out X-rays, ­ultrasound machines and microscope, and blood analyser machines. 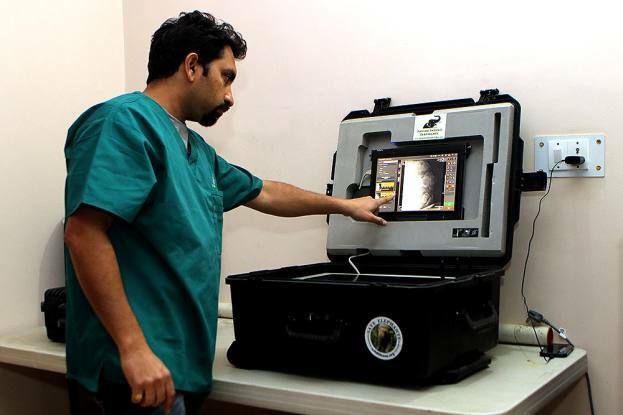 The blood and faecal samples of the animals are tested every three months to check for any diseases or deficiencies. They’re also working on what the doctor calls ‘positive conditioning’ where, while vets clean the wounds, the animal keepers feed the animals their favourite food. It makes the ­animals associate a doctor’s presence with a pleasant experience. 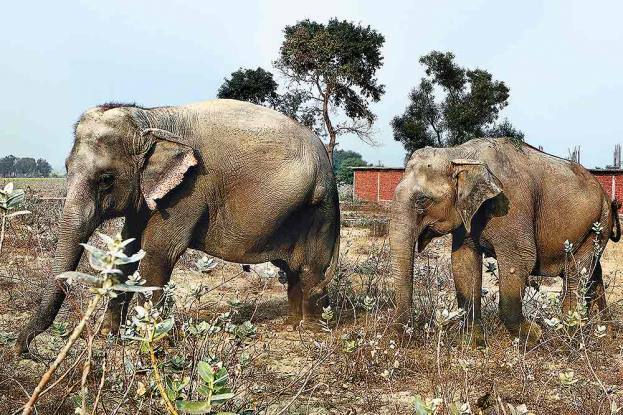 Mostly, the forest department of a state notifies Wildlife SOS about a rescued elephant, says Shivam Rai, the education officer at the facility. At other times, the care centre receives information independently about injured or abandoned elephants on its own. In both cases, it sends the elephant ambulance for fetching the animal. Rai shows other tools such as a poking rod and spiked chains that have been kept at the facility to create awareness. Most elephants have marks on their legs from the wounds caused by chains that kept them captive. 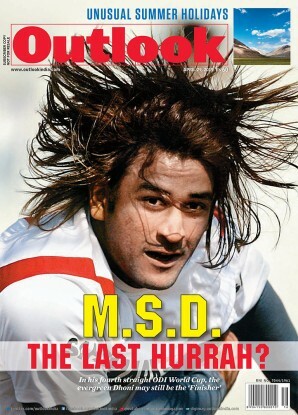 Some have ripped ears, a result of careless use of ankush by the mahouts. Some have cracked toenails, caused by walking on concrete floors for long. 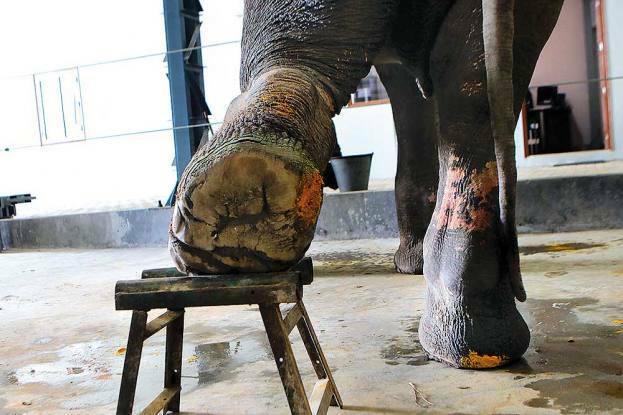 Untreated wounds and infections have also led to permanent ­deformities in some of the elephants. Gajraj, who is being treated by the veterinary doctor at the hospital has abscesses on both his hindquarters. 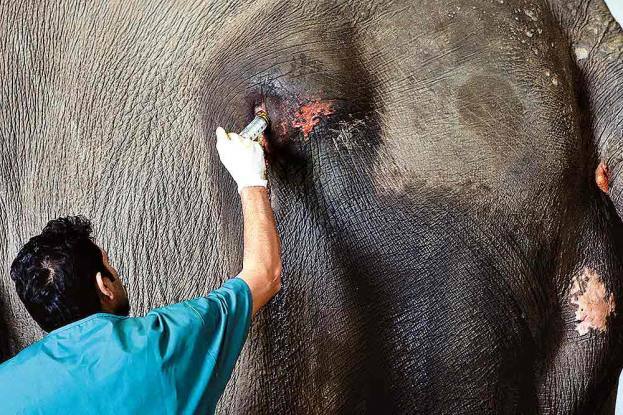 The wounds of elephants take months, even years, to heal, says Dr Yaduraj. Gajraj was rescued from a temple in Aundh in Maharashtra’s Satara district in June 2017. 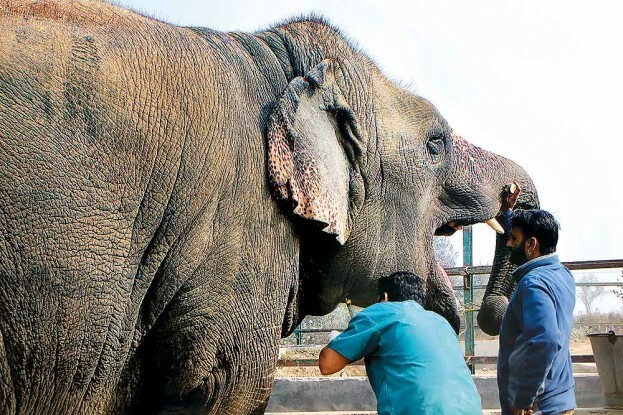 A female elephant was found to be grossly overweight, which was a res­ult of her being fed on junk food ranging from vada pav to sweets outside the temple where she was held captive. Another elephant went blind, the officer said, which could be owing to poor diet and consequent nutritional deficiency. The elephants at the facility are kept in enclosures in groups of 2-4 and taken out for walks every evening. Every day, five tonnes of fodder, besides fruits and vegetables, is purchased to feed the 21 elephants. Most of the animal keepers at the facility are from the mahout community, who earlier handled the animals in captivity. Their traditional wisdom in elephant keeping is crucial for the conservation centre.